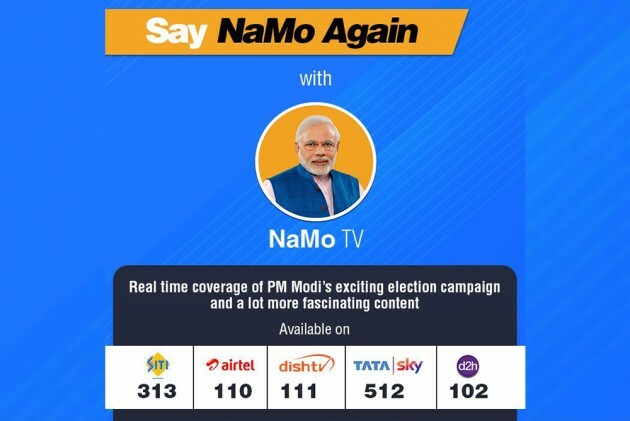 NaMo TV channel, available on various DTH and cable TV platforms, broadcast election rallies, speeches of PM Modi and interviews of BJP leaders. What Is Model Code Of Conduct? Did PM Modi Violate It By Announcing A-SAT? The Election Commission (EC) has issued a notice seeking a report from the I&B Ministry on NaMo TV channel, launched just weeks ahead of the general election. The notice comes after opposition parties, including the Congress, asked the poll body to direct the ministry to suspend the channel as it was violative of the Model Code of Conduct. Reports said the EC has issued a notice to the Information and Broadcasting Secretary and asked him to submit a report on the channel and its launch by Friday evening. NaMo TVchannel, also called 'Content TV', carries the picture of Prime Minister Narendra Modi as its logo. It was launched on March 31, nearly two weeks after the Model Code of Conduct came into effect and ahead of the Lok Sabha polls beginning April 11. The channel, available on various DTH and cable TV platforms, broadcast election rallies, speeches of the prime minister and interviews of BJP leaders. Though the ruling BJP has maintained that it does not own the channel or the platform, its official Twitter handle had urged people to watch it for the prime minister's election campaign. Union minister Piyush Goyal had also tweeted about the channel number while asking viewers to watch the prime minister's events. According to a report in The Print, NaMo TV never applied for a broadcast licence. It also does not have a compulsory security clearance.